Commissioning of the compressors is expected in 2020. Once completed in 2021, the SMR will become the largest hydrogen production unit in the US, increasing the gas company's hydrogen capacity to more than 1.5 billion ft3/d. "Over the past two decades, Siemens has established trustful cooperation with this customer to expand its US Gulf Coast hydrogen pipeline system, which is one of the largest in the world," said Patrice Laporte, Vice President, Siemens Gas and Power, Oil & Gas for the Americas. 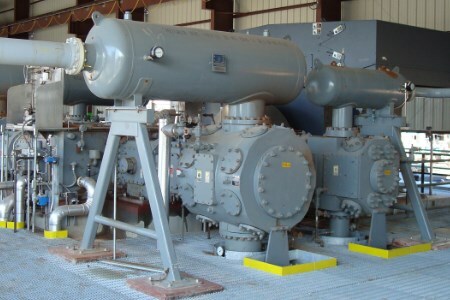 "This recent order builds on our companies' longstanding partnership and will mark the 23rd, 24th, and 25th reciprocating compressors that Siemens has supplied to this gas company since 2001." With the goal of maximising efficiency and reducing costs, the customer selected a standardised product design for the SMR. The three 12.75-in.-stroke 5HHE-VL reciprocating compressors will feature similar configurations to units that have been supplied to the customer in the past. Critical to the design is the non-lubricated cylinder construction, which eliminates the need for a costly oil removal system. Additional design features include integrated lube oil consoles, a cooling water console, purge panels, pulsation vessels, intercoolers, aftercooler, relief valves, and process control valves. A slow-speed synchronous motor will drive the compressors. Designed for continuous service, maximum availability, and flexible operation, Siemens reciprocating compressors continue to be a preferred choice for customers in applications from refineries to pipelines. Interest in hydrogen is growing and driven in large part by increased demand by secondary users where hydrogen is a significant component to the manufacture of their end products. "Working early on to develop a standardised compressor design is yielding significant benefits by reducing plant design, engineering, and installation costs, decreasing personnel training requirements, and will allow our customer to minimise its inventory for spare parts," added Laporte. "We look forward to helping them efficiently and reliably supply hydrogen to their customers across the Gulf Coast region."